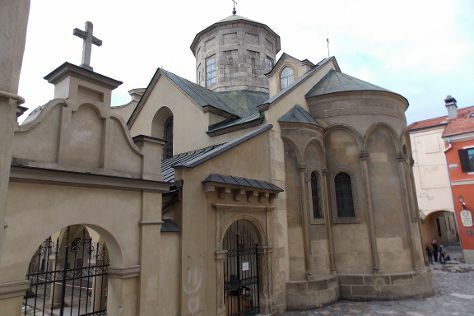 On the 16th (Wed), take a stroll through Old Town, step into the grandiose world of Potoсki Palace, then steep yourself in history at Armenian street, then make a trip to Market Square, and finally take in the architecture and atmosphere at Dominican Cathedral. On the next day, take in the architecture and atmosphere at Church of Sts. Olha and Elizabeth, contemplate in the serene atmosphere at Armenian Virgin Mary's Dormition Church, explore the world behind art at Museum of Folk Architecture and Life, stroll the grounds of Lychakiv Cemetery, then take in the architecture and atmosphere at Church of the Jesuits, and finally pause for some photo ops at Monument to Ivan Pidkova. For reviews, more things to do, where to stay, and other tourist information, you can read our Lviv itinerary maker tool . Kolkata (Calcutta), India to Lviv is an approximately 17-hour flight. Traveling from Kolkata (Calcutta) to Lviv, you'll gain 3 hours due to the time zone difference. Expect cooler temperatures when traveling from Kolkata (Calcutta) in January; daily highs in Lviv reach 0°C and lows reach -7°C. Finish up your sightseeing early on the 17th (Thu) so you can go by car to Mukacheve. Mukachevo is a city located in the valley of the Latorica river in Zakarpattia Oblast, in Western Ukraine. Start off your visit on the 18th (Fri): take in the spiritual surroundings of St. Nicholas Monastery, pause for some serene contemplation at St. Joseph Chapel, then take in the architecture and atmosphere at St.Martin Cathedral, then pause for some serene contemplation at Church of Pochaiv Madonna Icon, and finally explore the historical opulence of Palanok Castle. To find where to stay, more things to do, other places to visit, and other tourist information, read Mukacheve trip planner. Getting from Lviv to Mukacheve by car takes about 4 hours. Other options: take a train; or take a bus. In January, plan for daily highs up to 2°C, and evening lows to -5°C. Cap off your sightseeing on the 18th (Fri) early enough to go by car to Kamianets-Podilskyi. Kamianets-Podilskyi is a city on the Smotrych River in western Ukraine, to the north-east of Chernivtsi. On the 19th (Sat), pause for some serene contemplation at Cathedral of the Saints Peter and Paul, examine the collection at Museum of Miniatures Castles of Ukraine, pause for some serene contemplation at Dominican Monastery of St. Nicholas, explore the historical opulence of Khotyn Fortress, then examine the collection at Khotyn Historic Museum, and finally pause for some serene contemplation at Alexander Nevskiy Church. Get ready for a full day of sightseeing on the next day: take in the architecture and atmosphere at St. Nicolas Armenian Church, don't miss a visit to The Armenian Bastion, don't miss a visit to The Rome Catholic Podillya Bishop Palace, take in the architecture and atmosphere at St. Josafat Trinitarian Cathedral, then pause for some serene contemplation at Church of Peter and Paul, and finally pause for some serene contemplation at St. George Cathedral. 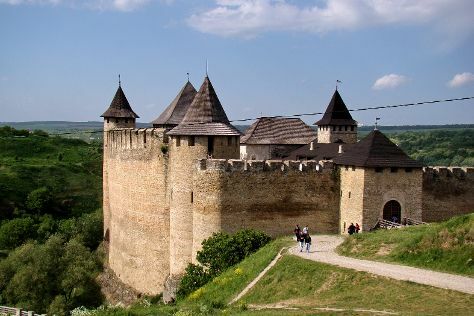 Use Inspirock's suggestions to plan your Kamianets-Podilskyi trip and find the best activities and attractions for your vacation. Getting from Mukacheve to Kamianets-Podilskyi by car takes about 7 hours. Other options: take a train; or take a bus. Traveling from Mukacheve in January, you will find days in Kamianets-Podilskyi are little chillier (0°C), and nights are about the same (-6°C). Cap off your sightseeing on the 20th (Sun) early enough to go by car to Vinnytsya. Vinnytsia is a city in west-central Ukraine, located on the banks of the Southern Bug.It is the administrative center of Vinnytsia Oblast and the largest city in the historic region of Podillia. Kick off your visit on the 21st (Mon): explore the world behind art at Vinnytsya Museum of Art, take in the architecture and atmosphere at Holy Transfiguration Cathedral, take in the spiritual surroundings of Jesuit Monastery, then examine the collection at Museum of Retro Technology Avtomotovelofotoradio, and finally examine the collection at Pirogov's Masoleum - St.Nicolas Church. For other places to visit and more tourist information, you can read our Vinnytsya road trip site . Getting from Kamianets-Podilskyi to Vinnytsya by car takes about 3 hours. Other options: take a bus; or take a train. Cap off your sightseeing on the 21st (Mon) early enough to catch the train to Kiev. Kick off your visit on the 22nd (Tue): contemplate in the serene atmosphere at St. Michael's Golden-Domed Monastery, explore the fascinating underground world of Kiev-Pechersk Lavra - Caves Monastery, then take in the spiritual surroundings of Saint Sophia Cathedral, then don't miss a visit to Andriyivski Uzviz, and finally make a trip to Khreshchatyk. Keep things going the next day: brush up on your military savvy at Great Patriotic War Museum and then see the interesting displays at Pirogovo Open-Air Museum. To see reviews, where to stay, traveler tips, and more tourist information, go to the Kiev online driving holiday planner . You can take a train from Vinnytsya to Kiev in 2.5 hours. Other options are to do a combination of flight and shuttle; or drive. In January in Kiev, expect temperatures between -1°C during the day and -7°C at night. Wrap up your sightseeing on the 23rd (Wed) to allow time to take a train to Poltava. Kick off your visit on the 24th (Thu): view the masterpieces at Museum of Ukrainian Pottery, then see the interesting displays at Long-Range Strategic Aviation Museum, and then pause for some serene contemplation at St. Panteleimon Church. Here are some ideas for day two: see the interesting displays at The Poltava Museum of Local Lore, examine the collection at Ivan Kotlyarevskiy House, take in the architecture and atmosphere at Savior Church, get engrossed in the history at The Poltava Battle History Museum, then pause for some serene contemplation at St. Sampsoniy Church, and finally pause for some photo ops at Peter I Monument. For ratings, photos, where to stay, and tourist information, you can read our Poltava road trip website . Take a train from Kiev to Poltava in 3 hours. Alternatively, you can drive; or take a bus. Cap off your sightseeing on the 25th (Fri) early enough to travel to Odessa. 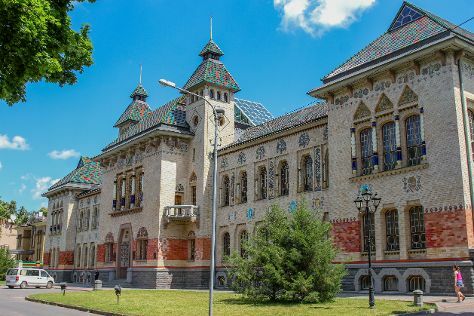 Though most famous for the Potemkin Steps leading down the Black Sea coast, Odessa welcomes visitors with several other attractions, including beaches and an ornate opera house. 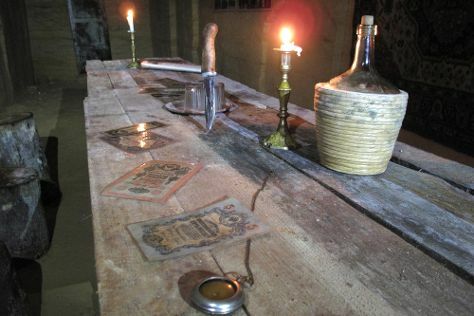 On the 26th (Sat), see the interesting displays at Secrets of Underground Odessa Museum, examine the collection at Shustov Cognac Winery Museum, Head underground at Catacombs of Odessa, then don't miss a visit to Teatralnaya Square, and finally see the interesting displays at Insomnia- The Haunted House. On the 27th (Sun), you'll have a packed day of sightseeing: see the interesting displays at Museum of Interesting Science, then stroll through Beach Golden Shore, and then get engrossed in the history at Memorial of Heroic Defense of Odessa Museum. To see ratings, photos, reviews, and more tourist information, go to the Odessa trip planner. You can do a combination of train and flight from Poltava to Odessa in 7 hours. Other options are to do a combination of train, shuttle, and flight; or drive. In January in Odessa, expect temperatures between 1°C during the day and -5°C at night. Cap off your sightseeing on the 27th (Sun) early enough to travel back home.